This Land Cruiser was custom-built for weekend drives and overland adventures in the Middle East. Equipped with an adaptable powertrain, super-tough materials, and classic looks, it's ready to take on city streets, and desert sands. Those who go for the hardtop get a premium look and a quieter cabin, not to mention an extra place to stow cargo when a roof rack is installed. But whether our builds are served up hard or soft, it is the details that matter: the classic grille, the heavy-duty tires, the emblems, the latches, and louvers — everything that made the 40 series the most popular Land Cruisers of all time. The Middle East is one place on earth where these rugged 4x4’s can truly be put to the test. And like its desert-roaming relatives, this one always up for a rock-crawling, sandblasting adventure. The upgraded engine and running gear add more horsepower and ride comfort to the classic equation, while the revitalized 4-wheel drive is there to remind you that this Cruiser came to play. 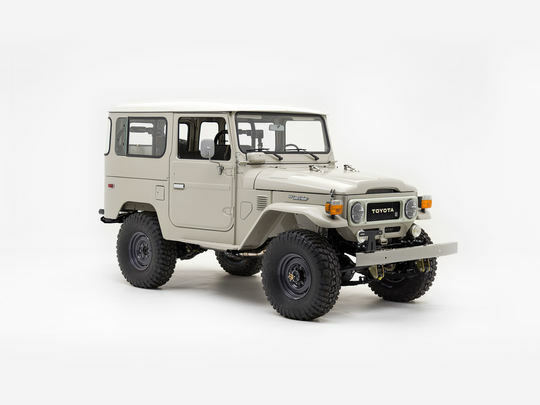 Here, in the cabin of this FJ40, nothing distracts from the original look of these heavy-duty Land Cruisers - the classic stitching, the rugged knobs and gauges, and, of course, the painted steel dash. It’s like taking an extra comfortable trip down memory lane, where features like climate control, a digital radio, even Bluetooth connectivity, are never far from reach.